NRL develops 'safer' lithium-free battery. 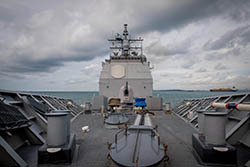 Researchers at the US Naval Research Laboratory’s (NRL) Chemistry Division have developed what they describe as a safer alternative to ‘fire-prone’ lithium-ion batteries, which were recently banned for some applications on US Navy ships and other military platforms. However, manufacturers of new types of lithium-ion batteries used on ships would undoubtedly argue that their batteries are far safer than early generation units. Joseph Parker, Jeffrey Long, and Debra Rolison from NRL’s Advanced Electrochemical Materials group are leading an effort to create an entirely new family of safer, water-based, zinc batteries. They have demonstrated a breakthrough for nickel–zinc (Ni–Zn) batteries in which a three-dimensional (3-D) Zn ‘sponge’ replaces the powdered zinc anode traditionally used. With 3-D Zn, the battery provides an energy content and level of rechargeability that rivals lithium-ion batteries, whilst avoiding the safety issues that have sometimes been raised about lithium. Their research appeared in the 28 April, 2017 issue of Science, the journal of the American Association for the Advancement of Science. Additional contributors to this research article include former NRL staff scientist, Christopher Chervin, National Research Council postdoctoral associate, Irina Pala, as well as industry partners Meinrad Machler and CEO of EnZinc Inc, Michael Burz. Zinc-based batteries are the go-to global battery for single-use applications, but are not considered rechargeable in practice due to their tendency to grow conductive ‘whiskers’ or dendrites inside the battery, which can grow long enough to cause short circuits. Extending lifetime in single-use cells. Cycling cells more than 100 times at an energy content competitive with lithium-ion batteries. Cycling cells more than 50,000 times in short duty-cycles with intermittent power bursts, similar to how batteries are used in some hybrid vehicles. With the benefits of rechargeability, the 3-D Zn sponge is ready to be deployed in the entire family of Zn-based alkaline batteries across the civilian and military sectors. NRL’s work was funded by the Office of Naval Research and the Advanced Research Projects Agency-Energy.